As the Atlantic coast prepares for Hurricane Irene to make landfall, the National Oceanic and Atmospheric Administration is constantly updating maps of its path. 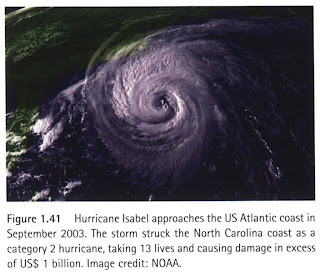 Ball State University Libraries’ GIS Research and Map Collection (GRMC) on the second floor of Bracken Library houses a number of maps and atlases depicting hurricanes and other natural hazards. The map above (click to enlarge) shows Hurricane Isabel from September of 2003, the last major hurricane to strike the coast of the Carolinas. This map is from the World Atlas of Natural Hazards by Bill McGuire published in 2004. The atlas includes maps of historic events and their impact, hazard management, and future prospects for natural hazards. The GRMC also includes maps of the relative water depth of New Orleans just after Hurricane Katrina, world maps of the most intense tropical storms, and a map of the Caribbean that includes a hurricane log.